본 포스팅은 한국어 버전도 있습니다. Find jobs for friends and get paid. We’ve all been taught to share since childhood because it’s the “right” thing to do. At JobSeekr we’re taking this a step further, so now you can get paid a referral reward for eligible jobs when a friend you refer gets hired. Help your friends and yourself all at once! So when you're browsing through jobs, even if what you see isn't right for you, the opportunity might be perfect for one of your friends. 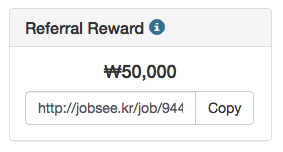 Following the launch of JobSeekr Referral Rewards, keep an eye out for jobs featuring paid rewards. This is the amount you stand to gain by introducing a successful applicant to a new job. So while you’re congratulating your friend on getting that job on JobSeekr, you can also be celebrating the referral reward you just won. To qualify for referral rewards, simply login to JobSeekr and copy your unique link from each job post to share with friends. Create a seeker profile today and start sharing this amazing Marketing Intern at Sunshine App position with friends and qualified applicants. Why? Because if your friend gets the job, you get paid. Why else? Because Sunshine App is a great way to share files with friends, and Spika is an amazing company headed by an awesome CEO. Win-win. Read more about Sunshine App and their team online, then start sharing around your referral link. We'd love to hear what you think. Leave a comment below.